Shutter lag can be a most frustrating experience for a photographer trying to take a picture of anything in motion, whether it be a rare bird or a speeding car. By the time the camera has finished taking the photo the subject will have disappeared from the frame. Astrophysicists sometimes meet the same problem when trying to capture and record high speed events. They need to ensure that they take measurements much faster than the actual event otherwise the experiment will not record anything. Professor Tom Marsh from Warwick University explained how scientists carefully choose a measurement rate that fits the object they want to study. For example, on a white dwarf star (which has the mass of the Sun condensed into the size of the Earth) things change in a matter of seconds. These stars have strong magnetic fields that produce ephemeral hot spots on their surface. Even faster is the Crab Pulsar, a wildly spinning neutron star that is denser and smaller than a white dwarf star. This is rotating at the giddy speed of 30 times a second. It is only about 30km across yet has about two solar masses and is the remnant of a supernova explosion. It is easy in theory to decide how fast to take measurements but sometimes researchers have to push current technology to the limit in order to capture data at the correct rate. 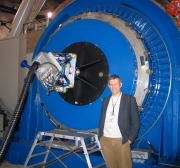 Professor Marsh has been involved in the development of a new camera called ULTRACAM. This is a set of 3 CCDs each 1024 by 1024 pixels that take snapshots 500 times a second in three colours. It was fitted to the Very Large Telescope in Chile and one of its first observations was of the faint object "GU Muscae". This object is actually two bodies and consists of a black hole in a 10-hour orbit with a normal, solar-like star. The black hole is surrounded by a disc of material transferred from the normal star. As this material falls onto the black hole, energy is released, producing bright flares. Although it is one million times fainter than what can be seen with the unaided eye ULTRACAM detected a series of sharp flashes roughly 7 minutes apart. Astronomers think that there must be some sort of stable structure in the disc of matter surrounding the black hole. ULTRACAM was the first UK-built instrument to be placed on the Very Large Telescope. It is easily operated using a web browser interface and having no moving parts is very reliable and can be easily taken to many of the world´s largest telescopes. Professor Marsh and his team are currently perfecting a new version of the camera called ULTRASPEC which specialises in spectroscopy i.e. the study of starlight.